Hey hey! I am so happy to have a new Meal Prep Monday post for you today! I haven't been meal prepping much at all lately - my routine's pretty much gone out the window. As I keep telling you, I've been crazy busy at work, and also had a cold for a little while, plus there's been lots of general changes at work and at home! (It's finally started to calm down at work a little, but instead of getting back to the gym and getting on top of the chores, I've prioritised socialising with friends. I know, I'm a terrible person). I wish I could say that I've been revisiting old meal preps, or resorting to my basic tuna-salad-brown-rice combo, but really I've been buying lunch frequently, and occasionally bringing leftovers if we had any, (and in those cases, it's mainly been Sandra cooking). However, I got organised last weekend, and I am super pleased with the Meal Prep that I made. 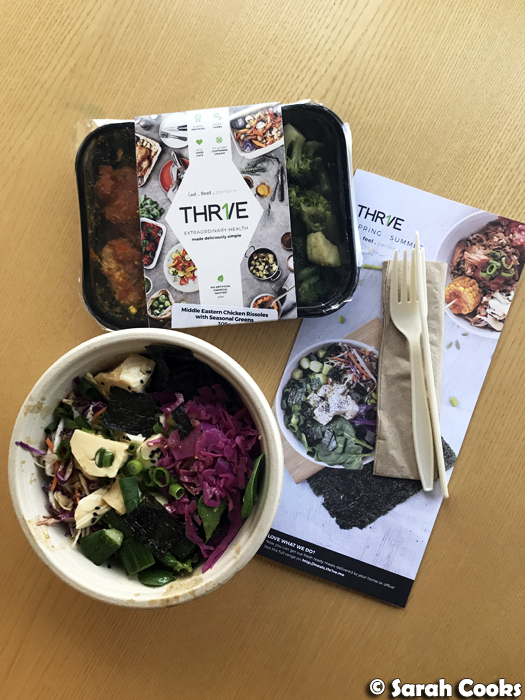 We've got a silken tofu rice bowl, with marinated silken tofu, edamame, coleslaw, cucumber, pickled ginger and baby spinach, on a bed of brown rice and quinoa. Boom! Vegetarian! Vegan! Gluten free! High in fibre! Vegetarian protein! Lots of brightly coloured vegetables! Super nourishing and so tasty! We can do this! I was inspired to make this meal prep from the Macro Bowl on the new Spring/Summer menu at Thr1ve (not sponsored). The other day I needed to buy a quick lunch to be inhaled, alone, at my desk. I wasn't feeling particularly enthused about lunch (I know, weird), there was nothing particular that I was craving, and just needed something to eat, so I figured it may as well be healthy. Well, I picked the Macro Bowl at Thrive (and it happened to come with a free ready-meal that day, wahey! ), and I was surprised by just how good it was! It had a brown rice/quinoa base and lots of different vegetables, but the kicker for me was the tofu. The silken tofu came in a soy-based marinade, and it reminded me of my beloved Chinese silken tofu dishes (silken tofu with avocado; silken tofu with century egg) that I like to make for friends and family. So, with that idea as my starting point, I put together my own meal prep for the week. I threw this one together very easily - it looks fancy but is basically an assembly job, and all of the ingredients are available at my local supermarket. (Not all supermarkets stock edamame, but they're usually available at Asian grocers and sit perfectly and patiently in the freezer). 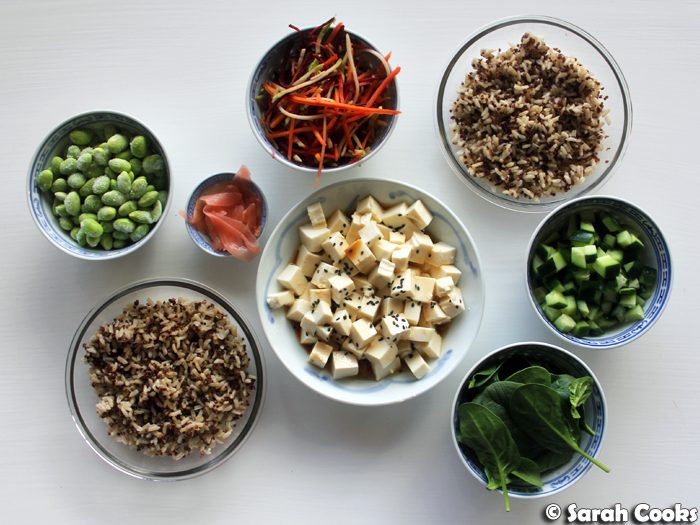 The most arduous part of the whole process was chopping the tofu, and sprinkling over soy sauce, sesame oil and sesame seeds. I gotta admit, I was super lazy (or efficient?) and bought pre-prepared coleslaw mix, and even used single-serve packets of pre-cooked brown rice & quinoa, but feel free to cook your own from scratch. From start to finish, the bowls took less than thirty minutes to make (and that includes the photography). Winner! Perhaps in the next few weeks I'll have more time to plan, shop, and prepare, but for now this was the perfect way to ease myself back into meal prepping. However, these certainly didn't taste like a shortcut or a consolation prize. They were super delicious, and very nourishing. Chop 300 grams of silken tofu into cubes. Carefully transfer to a wide shallow bowl. Drizzle over 2 tablespoons soy sauce (gluten free if required) and 1/2 teaspoon sesame oil, and sprinkle with 1/2 teaspoon black sesame seeds. Divide 4 x 125 gram microwavable packets of brown rice and quinoa between 4 containers or serving bowls. 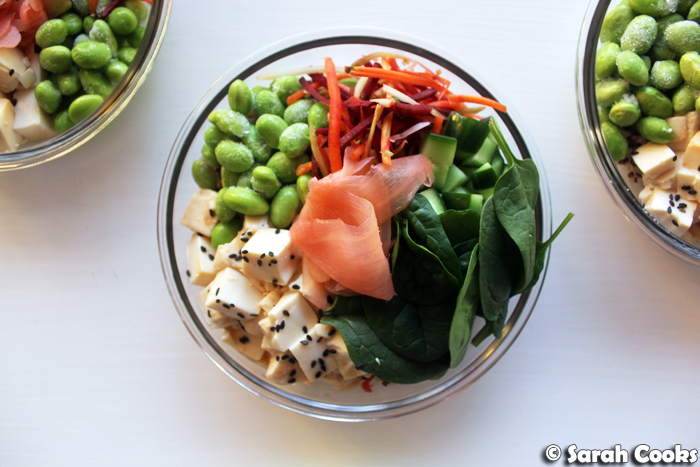 Between the rice bowls, divide 1 cup edamame, 2 handfuls baby spinach, 2 handfuls coleslaw mix, 1 diced Lebanese cucumber, and 50 grams Japanese pickled ginger (check for gluten free if required). Hey! This recipe is so amazing! Easy to make and delicious! 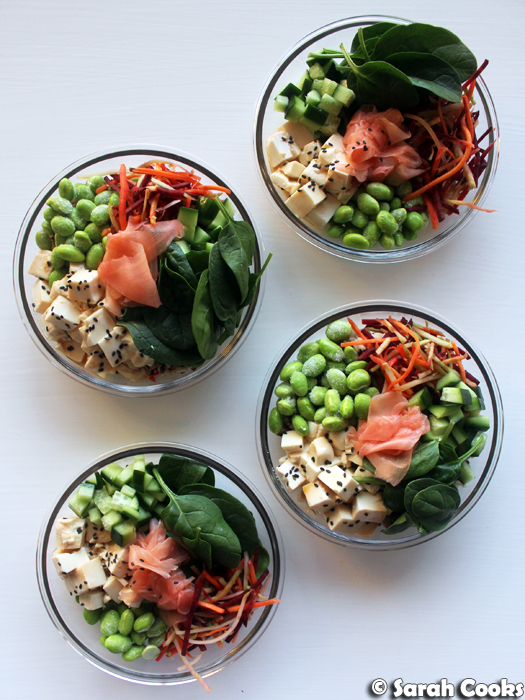 Tofu rice bowls have made my day! One try is not enough for this one, will try it again!